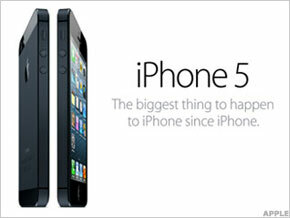 NEW YORK ( TheStreet) - Apple's ( AAPL - Get Report) iPhone 5 continues to grab the headlines, as evidenced by the tech giant's results last week. Clearly, the smarter, lighter, faster, taller incarnation of the iconic smartphone has proved irresistible for gadget junkies. In fact, some reviews have been reminiscent of Kanye West's "Stronger" lyrics. Apps that have yet to be adjusted for the iPhone 5's slightly larger screen, which is 1,136-by-640 pixels versus the iPhone 4's 960-by-640 pixels, will display between a top and bottom border to simulate the old screen size. Perhaps the best way to take advantage of the iPhone 5's slightly larger and higher quality screen is the social video app Vyclone. Ideal for sports spectators, concert fans, citizen journalists and wedding guests, Vyclone enables its users to create multi-angle masterpieces of events through crowdsourcing. Users can film or upload a video, and the app's geo-location feature automatically synchronizes it with up to three other clips shot around the same time and location, lining them up by the date and time they were shot, rather than the time they were uploaded. Users also have the option to make manual edits to the raw footage by applying filters or choosing angles. The results can then be shared through Twitter, Facebook ( FB - Get Report) and YouTube, or by pinning it to the film location for other users to view when visiting the site. This free app is compatible with iPhone, iPod touch, and iPad, but requires iOS 5.0 or later. Cinemagram, which allows users to create a hybrid between photo and video, is another stellar app that takes advantage of the iPhone 5's 4-inch screen and extended battery life. Cinemagraphs, or still photographs in which minor or repeated movements occur, traditionally take photographers hours to produce. With Cinemagram, users can record or upload a 2 to 3-second video clip, isolate a small, animated region, and leave the rest as a still image. Like Instagram, this app offers vintage and cross-processing filters and ways to share the cinemagraphs with friends. This free app is compatible with iPhone 3GS, iPhone 4, iPhone 4S, iPhone 5, fourth and fifth generation iPod touch, and second and third generation iPad, but requires iOS 5.0 or later. To edit photos taken on Apple's new smartphone, download Photo Editor by Aviary. Aviary's 12 free editing features can support photo editors of all levels. If simply selecting "enhance" or applying an "effect" is not sufficient, users can adjust lighting, using brightness, saturation and contrast tools, or crop, rotate or straighten the image. The cosmetic features to fix redeye, remove blemishes and whiten teeth are probably the most useful tools for detail-oriented editors. And for the less subtle, there are tools for adding drawings, customized text and silly stickers. The app also offers the option to share the improved shots on Facebook, Twitter, Tumblr or Flickr. The developers of this easy-to-use app seem to have thought of everything; however, they do accept feature suggestions on their Web site. This free app is compatible with iPhone 3GS, iPhone 4, iPhone 4S, iPhone 5, fourth and fifth generation iPod touch, and second and third generation iPad, and requires iOS 5.0 or later. Pocket, formerly known as Read It Later, enables users to pause their web, Twitter, Flipboard or Pulse surfing. Articles, videos or web pages saved in Pocket are catalogued next to thumbnail images and automatically synced with subscribers' mobile devices for later viewing. Perhaps most impressive is that accessing the content saved in Pocket does not require an Internet connection, so users can read, view and review while in transit or in flight. And, unsurprisingly, Pocket's clean layout benefits from the iPhone's larger screen and improved battery life. This free app is compatible with iPhone, iPod touch, and iPad, and requires iOS 5.0 or later. Runners and cyclists will appreciate the lighter, thinner version of the iPhone when using Strava Cycling and Strava Run. Strava's apps track distance, speed, elevation, heart rate, power, and calories burned during workouts and automatically record the information on Strava.com. Accumulating these statistics enables users to self-challenge by setting personal goals, compare and compete with other athletes, or strive for the "King and Queen of the Mountain" honors awarded by the app. Athletes can also discover new rides and runs by viewing their friends' records. The social feature, which allows athletes to comment on one another's activities, certainly has the potential to liven-up a solo workout. Users can subscribe to the premium service on the Web site or through the iPhone for $5.99 per month or $59.99 per year. The Strava premium package offers Filtered Leaderboards to benchmark against those of a like age and weight class; Power Zone Analysis to monitor power output and watts (for cyclists) and speed and focus (for runners); Heart Rate Analysis; and Suffer Score to quantify the degree of suffering. The app is compatible with iPhone, iPod touch, and iPad, but requires iOS 4.3 or later.